By Daniel Horowitz- A team from IsraAID, the Israeli-based humanitarian organization, and a partner agency of United Jewish Appeal of Greater Toronto, has just arrived in the Philippines. The IsraAID team, comprised of seven Israeli professionals including medical, trauma, and relief specialists, is on the ground to assist in the aftermath of Typhoon Haiyan, which slammed into the central Philippines on Friday, November 8th. The typhoon triggered landslides, blocked roads, uprooted trees and killed at least 1,200 people, while forcing an estimated 750,000 people to flee their homes. The IsraAID team will soon be boarding a Philippine army plane, the safest and fastest way to reach the stricken area, where they will perform a thorough situation assessment that will determine the best rapid response Israel can provide to the government and people of the Philippines. The IDF plans to send a delegation of 100 individuals to the Philippines tomorrow afternoon, Israel time. When news of the typhoon spread, United Jewish Appeal of Greater Toronto quickly established its UJA Philippines Typhoon Relief Fund. 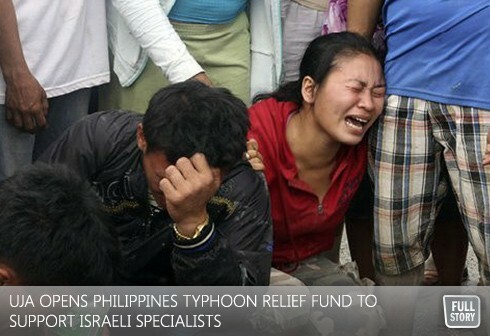 One-hundred percent of funds raised will go to IsraAID in supporting their efforts in the Philippines. Overnight, since its creation, the UJA Relief Fund has already raised more than $27,000. IsraAID has been working closely with the Prime Minister’s office, the Ministry of Foreign Affairs, Israel’s Ambassador to the Philippines, and local government officials, among them the mayor of Tacloban, the city most affected by the tragedy.